Mark Carney, the Bank of England governor, issued a warning recently that climate change poses a huge risk to global stability. At a gathering of leading insurers at Lloyd’s of London, Mr Carney pointed out that the rapid increase in weather-related catastrophes was causing a spike in financial costs. But he also warned that the challenges currently posed by climate change “pale in significance compared with what might come”. He said our generation has little incentive to avert future problems. Ironically, insurers are among those with the biggest interest in climate change as the syndicates operating at Lloyd’s, the world’s oldest insurance market, are the most exposed to disasters such as hurricanes and floods. Mr Carney said the after-effects of such disasters were likely to grow worse: “The challenges currently posed by climate change pale in significance compared with what might come. “The far-sighted amongst you are anticipating broader global impacts on property, migration and political stability, as well as food and water security.” Who is responsible? We can blame politicians for failing to act sooner. We can criticize multinational corporations for exacerbating climate change through the exploitation of oil, gas and other natural resources. Or we can acknowledge that the Christian Church, which is the largest religious movement in the world, has largely failed to fulfil its responsibility to care for creation. Church leaders have not, until relatively recently, acknowledged that creation care is integral to the gospel. That is why climate change will not be averted solely by the appliance of science or technology. Nor will global hunger or poverty be resolved by developing better GM seeds or giving more IMF loans. Civil strife and war will not be resolved by bombing religious extremists, imposing Western democracy or by recruiting more UN peace keepers. The reason is because the problem lies much deeper, deep in the human heart. The heart of the human problem is the problem of the human heart. Which is why Psalm 8 is as relevant today as when first written 3,000 years ago. There are three parts to this beautiful psalm – what C.S. Lewis described as “This short exquisite lyric”. The psalm begins and ends with the same refrain, “Lord, our Lord, how majestic is your name in all the earth” (Psalm 8:1, 9). This psalm spans time and space. It looks back to creation in Genesis (8:1-3) and looks forward to the recreation of the new heaven and earth (8:6-9). And in the middle stands humanity and an enigmatic prophecy of the coming of our Saviour, the Lord Jesus Christ (8:4-6). There is something awesome about the heavens at night, with millions of stars and galaxies twinkling silently their message. Here is, as John Stott observes, “a recognition of the majesty of God’s name, or nature, which his works reveal in both earth and heaven. The enemies of God, blinded by their proud rebellion, do not see his glory; but they are confounded by children and infants.” Indeed, Jesus quotes from this psalm to rebuke the arrogance of the religious leaders of his day. They had objected to children shouting “Hosanna” as Jesus entered the Temple on Palm Sunday (Matthew 21:15, 16). Things have not changed. Stott says, “God is still glorified in the simple faith of children and in the childlike humility of Christian believers”. The Glory of God: Revealed in Creation. David asks the rhetorical question that sooner or later we all ask, “Given the vastness of the universe, of space and time, and our relative insignificance, who am I? I’m convinced that the majority of us go through life insecure about who we are, why we are here and where we’re going. Do you know who you are in the eyes of God? Do you know God’s plan for your life? Do you realise your destiny is to live as a child of God, crowned with glory and honour? What evokes David to burst into praise as he ponders the vastness of the night sky? God’s condescension to care at all for you and me. On many occasions as a young shepherd, David must have laid on his back at night and pondered the vastness of the universe from one horizon to the other. Looking up at the night sky and seeing millions and millions of stars twinkling in the dark makes you feel very small and very insignificant doesn’t it? Absurd perhaps but so true. The fall inspired not only the rebellion against God, and enmity between people but the destructive abuse and selfish exploitation of creation, for which we are now reaping the consequences in climate change. While our divinely ordained status is only slightly inferior to angels, sin has marred God’s image in us. It has corrupted God’s purposes for us. As a consequence, creation has been cursed (Genesis 3:17). And with every passing generation the dire condition of life on earth seems to get worse. Everything in creation is not as God intends. Mankind has rebelled against God and treated the world as something to be plundered and exploited and fought over as if it were ours by might and right. The Glory of God: Revealed in Creation. The Frailty of Humanity: Stewards on Earth. Through the lens of the New Testament we realise this Psalm moves from the vastness of the universe, to the littleness of human beings, then, albeit enigmatically, to the greatness of God’s redemptive plan for all people on earth revealed in the Lord Jesus Christ. Quoting these verses from Psalm 8, the writer to Hebrews points to God’s rescue plan to redeem mankind and restore the harmony and order of creation. Humanity has indeed “sinned and fallen short of God’s glory” (Romans 3:23) in the way we have treated His world. Consequently, in Jesus… this dominion has been restored. It is in Him rather than in us that humankind’s dominion is exhibited. Jesus has now been crowned and exalted to God’s right hand. So in these verses, David is describing God’s original purpose for mankind, “you made him ruler over the works of your hands” (Psalm 8:5-6) but points to the One who would come to earth to fulfil that purpose and redeem not just people but creation also. The Lord Jesus Christ. The Grace of God: Fulfilled by Jesus Christ. So the dominion described here is first and foremost referring to the Lord Jesus Christ. God’s expectation is that as we acknowledge him, and His Spirit dwells within us, we will demonstrate our servant hearts as stewards of his creation. The apostle Paul also quotes this psalm to describe how in Jesus Christ, we regain our position in Jesus Christ. That means every human being, including the boat people, the refugees, the asylum seekers, the homeless, the widows, the orphans, the vulnerable, the elderly, are all created in the image and likeness of God. Christ died for each one of them. Our rights are not superior just because we are more powerful or more wealthy or speak English. Our rights are not absolute. We are not independent. The earth belongs to God. He has entrusted it to us to be shared, equally. Our responsibility is therefore related to our status. Only when we know who we are, we will know to what we are called to be. Only when we understand what Christ has done for us, only when we are in a right relationship with God, only when we understand our position, our destiny, our calling, our responsibility, only then will we become part of the solution instead of the perpetuating the problem of climate change. What can we do practically to make a difference to climate change and undo the damage caused by greed and exploitation? One way is to help us become an Eco Church. Together with Tearfund and A’Roche, the Church of England is encouraging each parish to become an Eco Church. We gave out leaflets last week. If you did not collect one, pick one up from the back table. On their website you ill find plenty of resources about creation care. 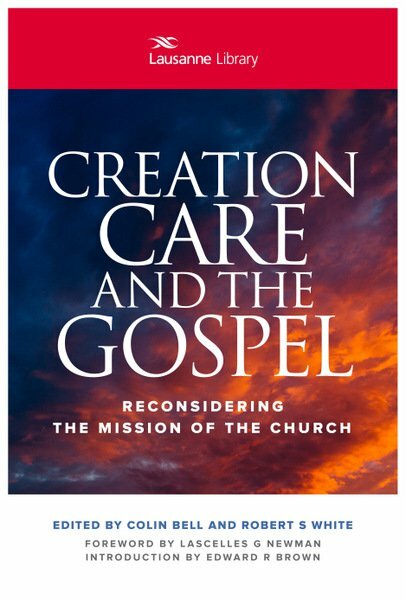 We are also recommending a book on the bookstall, Creation Care and the Gospel which is helping us reconsider the mission of the church. Anne Martin has also produced five Bible studies for our Home Groups which you can access from our church website. The Frailty of Humanity: Rulers on Earth. The Grace of God: Fulfilled in Jesus Christ. The Purposes of God: Realised by the Church. Three parts to this beautiful psalm. In each we learn something about the Lord God. He creates (8:1-3); He cares (8:4-5); He calls (8:6-9). Let’s heed His call, preserve this beautiful planet for our children’s children and fulfil our destiny. Lets pray. This entry was posted in Bible, Climate Change, Creation, Sermons, Theology on September 10, 2016 by Stephen Sizer.